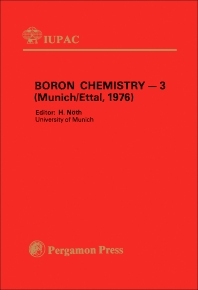 Boron Chemistry contains the selected lectures presented at the Third International Meeting on Boron Chemistry held at Munich & Ettal, FRG on July 5-9, 1976. Separating nine papers as chapters, this book discusses effects of orbital vacancies in boron compounds, the aminoboronation reaction, and the cyclic coordination of boron compounds. This text also explores the organoboranes in synthesis and analysis; the synthesis, structure, and chemical reactions of metalloboranes; and studies of the smaller boron hydrides and their derivatives.